There are pictures and there are images. The former most of us make most of the time… the latter are more elusive and require a little more thought. This piece of woodland just a short walk from where I live has the potential to be a photographic haven seen through imaginative eyes. The trees are tall and the lower trunks largely free from branches so the clear light of the southern Touraine enters from most sides. The canopy is dense in summer and bare in winter, so seasonal changes are very noticeable. The undergrowth is lush because river flood waters inundate the area regularly after storms upstream. In late Autumn, but before the leaves fall, the heart of this wooded area is dark and mysterious. Because it is late in the year and the sun is lower in the sky acute shafts of light intermittently arrow through to the inner reaches of the rich vegetation… here one minute, gone the next, only to reappear somewhere else behind or to the side. I know that to capture a lasting image I have to watch carefully and move fast. It is not the place for a tripod mounted camera… the visuals I seek dance around too haphazardly… and the wet ground is too soft. If I stand in any one spot for a few minutes my boots make sucking sounds as I urge my feet to move from their temporary captivity. Using a tripod is generally inadvisable and often futile… my carefully lined-up and framed horizontal or vertical reference will slowly – and unnoticed until too late – appear as a tilted one when I look at my shots later. This small haven is neither the Florida Everglades nor the French Camargue but I am aware of the elements to not get, quite literally, bogged down. 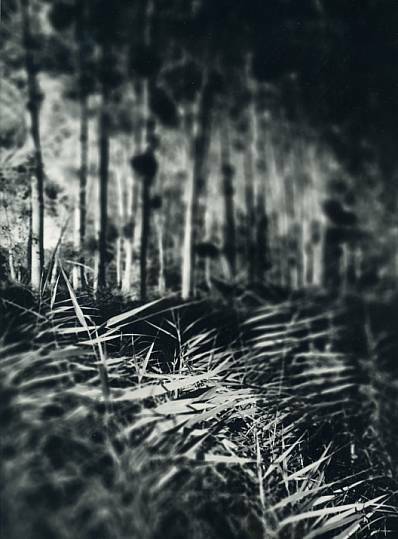 The above image I once made focused on the pointed dagger-leaved foreground reeds caught in a shaft of light. I had loaded one of my old Nikon F2 bodies with medium-speed fine-grain Ilford FP4 Plus film, and attached my 24mm Nikkor wide-angle lens for a wide coverage of the subject even though I was going to focus quite close. I wanted to throw the background further back by using a wide-angle lens rather than seeing a compression of the scene created by a longer lens. There was a constant breeze, and the individual leaves fluttered as if dragonfly’s wings. I wanted the biting sharpness of just a few of them to make a strong focal point to the image and so chose the fastest shutter speed possible with the lens’ aperture wide open. As you can see there was very narrow depth-of-field. But shouldn’t the depth-of-field of a 24mm lens even wide-open be “deeper” than shown here? The answer is yes… but I have manipulated the image in a very unusual way. I accept the visual effect of narrow-depth can probably be manipulated in Adobe Photoshop. I have used this program for 20 years but only for traditional publishing ends. I have no vocabulary of tricks using computer software… all my image manipulations (and there are few) are made in the camera whenever possible, or previously under the enlarger in my darkroom. And so it was, albeit accidentally, with this image. The previous negative I’d been printing from was medium-format and 6x7cms in size… but I inserted the narrower 35mm negative strip into the carrier not realizing that the glassless masks of my Durst Laborator 1200 Multigraph were the wrong size… that is, too large. Into the void slipped the free end of the fragile and flexible strip… on went the enlarger light… and a crazily curved and distorted image confronted me on the enlarger baseboard. By chance a narrow part of the drooping negative strip – which cut through the correct plane of focus above the enlarger’s lens – was the focal point of the entire scene… the dagger-like dragonfly-winged leaves. The manipulation of the image simply stemmed from that error. However, it took much more to make the print as seen here. After careful reframing, several test exposures were made to calculate the increase (burning-in) and decrease (dodging) in exposure of the top-right and lower-left areas of the image. But when I finally got it right I knew it was right… I had a print in my hands which had the feeling I wanted to express. There are “in-camera” techniques for making similar image manipulations. With indoor or near-to-home subjects I regularly used, hand-held even, my old Nikon PB-4 Tilt-and-Shift bellows unit with a Nikkor 105mm short-focus lens head. This is a rare combination… the versatile bellows unit has not been manufactured by Nikon for probably 30 years and the lens for more than 40 years. But with it you can tilt the lens panel relative to the film plane to gain depth-of-field. The same can be achieved with many large-format view cameras, or in the 35mm format with Canon’s 17mm, 24mm, 45mm and 90mm Tilt-Shift optics for the EOS system. Nikon’s range is slightly less comprehensive with three T/S lenses of 24mm, 45mm and 85mm focal lengths but no sign (yet) of an extreme wide-angle to partner them. Of course the “wiriness” of the out-of-focus foreground and background areas are not the result of poor lens “bokeh” (that oh-so-trendy originally Japanese photographic term for the rendering of out-of-focus highlights in a scene), they are simply very out of focus parts of the negative misplaced between the enlarger’s light source and lens. And the blobs on the tree-trunks are not the result of careless on-screen overcorrections with Photoshop’s cloning or spray tools… they are large bunches of Mistletoe. So there you have it… a simple mistake in the darkroom which became one of my special techniques for producing the type of image above. Try it for yourself… and be surprised. It makes a change from a LensBaby!